Barbecue smokers come in all shapes and sizes and believe it or not the equipment you choose to use for smoking meat is not as important as the method. I want to discuss the equipment available but more importantly I would like to talk about the methods that will allow you to smoke meat even if you cannot afford the best barbecue equipment. Let's start off with indirect method of smoking.. basically this allows you to use an ordinary grill as a smoker and believe it or not, you can turn out some excellent meat this way. 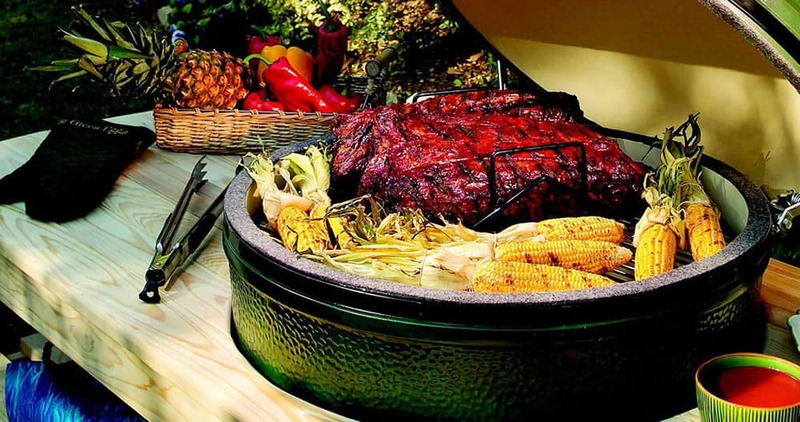 By indirect we mean you build a pile of hot coals on one side of your grill, throw on some barbecue wood for flavor and set the meat on the rack as far from the meat as possible. The main cliche for smoking meat is "low and slow" and in order to accomplish this you need to be able to create a smoky environment and maintain around a 230 degree heat source. 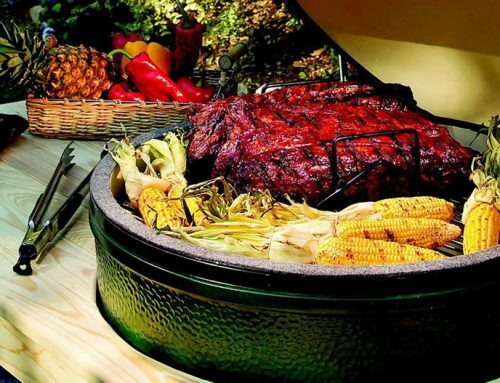 You can also set a water pan down in the coals to create steam.. we know that water boils and creates steam at around 212 degrees and as this steam mixes with the smoke it creates a moist environment and does a good job of keeping the ambient temperature inside the barbecue smoker or grill regulated to 210 to 230 degrees. 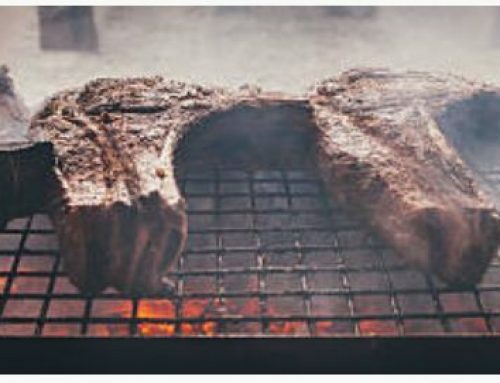 Another method requires either a storebought or a homemade smoking device where the bed of coals is usually beneath a pan of water and the meat is directly above the pan of water for the same purpose I descibed above. As a side note, you can use other liquids instead of the water or with the water.. your choice. I like to add wine and/or juice to the water pan occasionally for a different flavor. Feel free to experiment with this. The Brinkmann smoker is a popular vertical smoker manufactured to smoke meat using the configuration I described above. The brinkmann vertical barbecue smoker can be acquired for less than $50 and will usually require some basic assembly but for the novice smoker just starting out and as a way to get started without spending an arm and a leg, it is a decent unit. You can also build your own barbecue smoker from 55 gallon barrels or whatever material you happen to have available.. 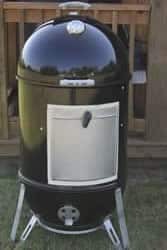 I have a pdf file ready for download called big_smokey.pdf with complete instructions on how to build your own smoker using two 55 gallon drums. 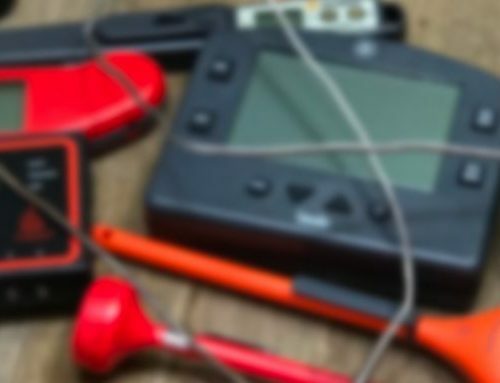 If you do not want to build your own then you can always find someone to build you one custom.. you design it the way you want it and then they build it according to your specifications. I am in the process of having one built this way.. the advantages are that I have been smoking for a long time using manufactured smokers and I have a pretty good idea of the features I like and the ones I don't. My custom barbecue smoker will be a one of a kind unit that is all mine from design to functionality. It is costing me less than $1000 and it will outlast me in terms of lifespan. We have a member of the forum who built his own smokehouse using materials he had laying around the yard.. click here to see the pics he sent in. 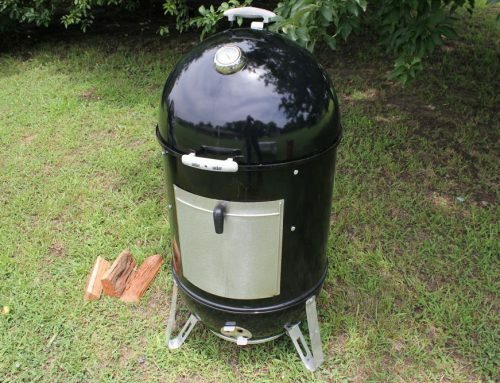 The Weber Smokey Moutain (pictured at the top of this page) is the Barbecue Smoker that I recommend most for beginners.. this is an excellent smoker for beginners and I even know of several competition teams who use this smoker and often win big on it.. The Amazing Weber Smokey Mountain Smoker often called the WSM. Click here to read all about it on our site. If you would like to read some reviews on the smoker then click on over to Amazon HERE.